Gotta tell u, can't wait for the lacquer to finish so I can get to wiring this up and play it. It plays well, and fret access is great. However, there's a few things I'd do differently next time. 1st off, I wish I will have more patience to really sand it down properly and make it smooth and sweet all round. 2nd, I'm very keen on finding a large maple, I mean real large, and cut a part of it that curves *just* right so I could make a guitar out of, literally, a single piece of wood. BUT also I don't want another build that has the neck parallel with the body; I want the neck, not just the headstock, tilted. It's just better that way. I ended up sanding WAY much off the surface to create at least a LITTLE tilt from the body to the neck...it just feels wrong to have the neck surface parallel with body surface and no clearance over the pickups. Also, although this seems to withstand the string pull just fine, the next build will have more wood in the neck/body joint. 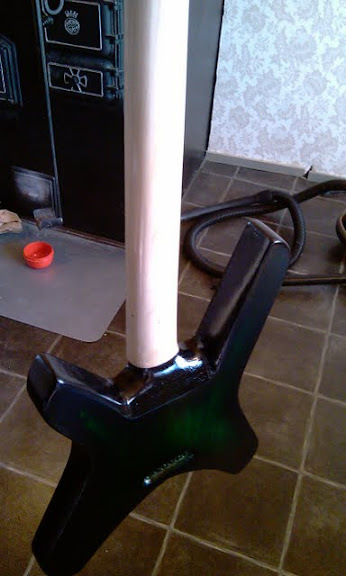 Now that the neck and the fretboard end before the body completely AND there is the cavity for neck humbucker, it just looks plain WAY too little wood there around that area. Next time I'll have the high strings area cleared like on this one but I'll have the body portion start from like 14th fret area or so on the bass side. And, I'll need to learn to use a top router better for the next project. What I'm thinking, I'll see if I can find a nice big maple with the right shapes, and cut a portion out of it, and leave it dry for 7-10 years and start working on it. I dunno if I mentioned it before, but the woods for this build came from a maple and a birch I felled off my own yard 7 years back...they've been drying next to a heater ever since.